Thomas Randall Rampy was born in Bell County, Texas in 1897. He graduated from Salado College, Salado, Texas in 1915. Prior to entering the military service, his experience was primarily in the fields of accounting and procurement with industrial engineering and construction organizations, including Stone and Webster Engineering Corporation, Boston Massachusetts; United Engineers and Constructors, Philadelphia, Pennsylvania; the Federal Public Works Administration; and Maxon Construction Company in Dayton, Ohio. 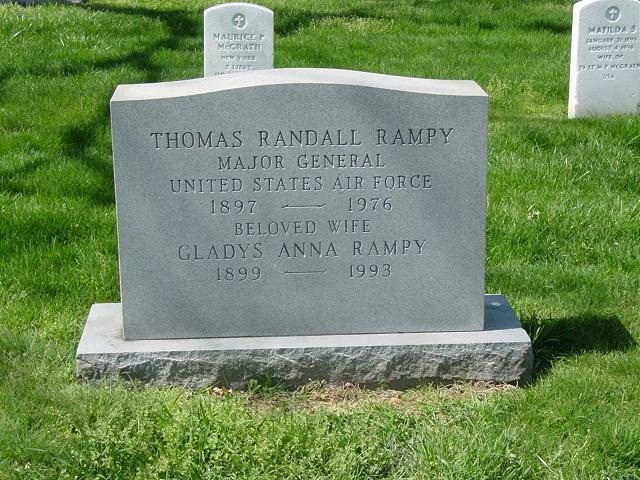 From 1941 to 1943 General Rampy was a civilian accountant with the Army Air Forces at Washington, D.C. Commissioned a Lieutenant Colonel in the Army of the United States on February 8, 1943, General Rampy was assigned to active duty as chief of the Contract Audit Division, Headquarters Army Air Forces, Washington, D.C. In December 1946 he was detailed to serve as chief of the Industrial Division, Army Audit Agency, in the Office of the Chief of Finance. In July 1948 General Rampy was designated the first auditor general of the U.S. Air Force at Washington, D.C. For the month of June 1951 he was assigned additional duty as the first director of accounting, Headquarters U.S. Air Force. He moved to Philadelphia, Pa., in May 1952, continuing his assignment as auditor general, U.S. Air Force. Transferring to the U.S. Air Forces in Europe in May 1954, General Rampy became deputy chief of staff, Comptroller, at USAFE headquarters in Wiesbaden, Germany. His decorations include the Legion of Merit.